The Association of the U.S. Army held a four-day training session at its national headquarters’ Gen. Gordon R. Sullivan Conference and Events Center for 25 AUSA chapter leaders in late June. 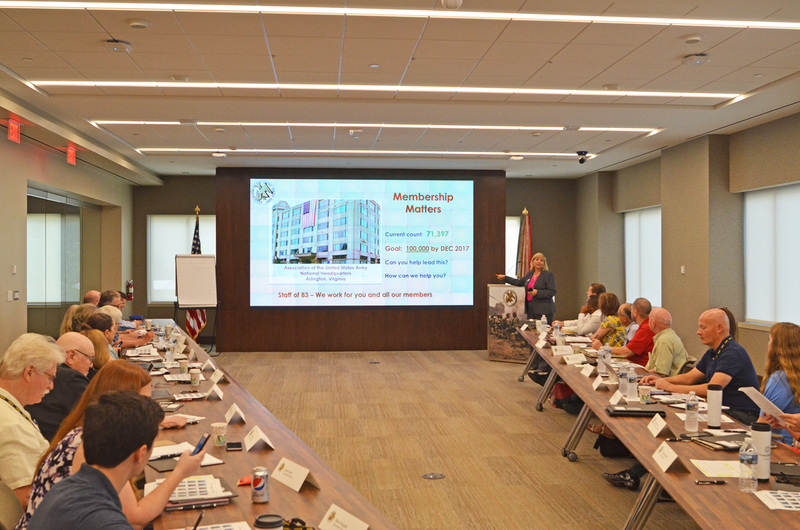 “AUSA hosts chapter leader development training to inform our chapter volunteer leaders on the many aspects of membership, and programs and projects of interest to their diverse membership,” said Col. John Davies, USA, Ret., senior director of AUSA membership. Lt. Gen. Pat McQuistion, USA, Ret., AUSA vice president for membership and meetings, greeted the chapter leaders and thanked them for attending and for their contributions in their local chapters. McQuistion stressed the importance of strong and committed volunteer leaders who unselfishly give of their time and talents to lead our chapters during these turbulent times for our nation. Topics discussed during the work sessions included: individual membership and recruiting and retaining members in the Regular Army, Army Reserve, National Guard, to include retirees and veterans; corporate membership; chapter communications; the importance of marketing; the Chapter Leader Portal and Magnet Mail; chapter programs; family programs and projects; and the Young Professionals membership and activities program. A highlight of the event was a discussion via “Go to Meetings” of chapter success stories led by Lt. Col. Don Spiece, USA, Ret., president of the Tucson – Goyette Chapter. Rhonda Sutton, vice president for corporate membership from the Redstone–Huntsville Chapter shared her take on best practices. Retired Gen. Carter F. Ham, AUSA president and CEO, closed the training session by thanking the attendees not only for participating in this training program, but also for their dedicated efforts and all they do every day in their chapters for the Army and the Association. Ham and McQuistion also presented each participant with an AUSA Graduation Certificate. Chapter leader attendees included: Miguel Aponte, Puerto Rico Chapter; Clayton Brown, Arizona Territorial; Jocelyn Cookson, Gen. John W. Vessey, Jr; Cindy Crow, Alamo; Brian Dragotto, Monmouth; Ernest Erlandson, Fort Pitt; Melia Flanagan, Robert E. Lee; and Thomas Hallin, National Training Center – High Desert. Also attending were: Julie Jarmiolowski, Arizona Territorial; Jeffrey Kline, Mid-Missouri – Fort Leonard Wood; William Medici, New York – Statue of Liberty; Sarah Nelson, MG Robert B. McCoy; Jeanne Savel, Saint Louis Gateway; Charles Seal; Monmouth; Paul Self, Sergeant Major Jon R. Cavaiani; Sarah Smith, Thunderbird; and Jerry Smith, CSM James M. McDonald – Keystone. Bernard Stolzman, Sixth Region vice president for membership; Rhonda Sutton, Redstone – Huntsville; William Temple, First Militia; David Toops, Greater Kansas City; Jen. Tregarthen, Gen. John W. Vessey, Jr.; Dan Vreeland, Saint Louis Gateway; Montgomery White, Pikes Peak; and Jorge Zequeira, Isthmian, were also in attendence.